After the Turkish army was defeated during the second siege of Vienna in the 17th century, the union of Austrian and Polish troops plundered the abandoned tents. Among other oriental valuables they found trunks of black beans with a bitter taste. The dark brew that the Turks prepared from them soon caused sensation among Viennese aristocrats. The first Western coffeehouses were founded soon afterwards and Vienna, Venice and Warsaw became hubs of the developing coffee culture. Back then, Salzburg was still an independent principality, but hey - it was the hippest Baroque place in Europe, so if the Viennese had coffee, Salzburg needed some, too. In 1703 Salzburg′s first Cafe opened - it was Tomaselli, back then in the Goldgasse, from 1760 onwards at the Alter Markt Square. By flattering measures it is Austria′s oldest Cafe and therefore, the oldest in the Western World (what a claim - don't tell any historians). 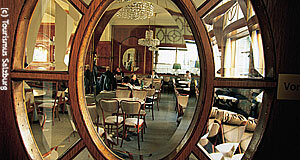 Some people say, that the most Viennese Cafe′s are in fact all in Salzburg. These people are generally not Viennese. However, it is definitely the case that much of the Cafe traditions that Austria is famous for have become diluted among chains and bistros in Vienna. On the other hand, many of the "classy" Cafes in Salzburg still maintain their pastry bars, waiters in dinner jackets and holders for newspapers, just like they have done for hundreds of years. Every tourist in Austria should have gone to a Cafe at least once to make a visit complete. In Salzburg, there are several good ones to choose from. Founded in 1703, the Tomaselli on Alter Markt Square is the T-Rex in the Jurassic Park of Caffeine. The man himself, Wolfgang Amadeus Mozart, had coffee there and so did generations of local and international artists such as Max Reinhardt, Michael Haydn or Hugo von Hoffmannsthal. The classy interiors are worth a visit and so is the coffee. Just around the corner of the Tomaselli in the Brodgasse, the Fürst headquarter is the site where Mozart′s balls were immortalised in chocolate for the first time in 1890. Today, a small exhibition underlines that here and only here you can buy the ORIGINAL Mozartballs. Chocolatier Paul Fürst was awarded a gold medal for his invention and today his Cafe proliferates like Starbucks in the US and opens branches all over Salzburg. Definitely a go-er! This one is slightly hidden just behind the horse well next to the Festival Hall. It is a very traditional cafe and due to its proximity to the Festival Hall, a favourite hangout for musicians and singers. Be prepared to have a cup of coffee with half of the Vienna Philharmoniker orchestra! This slightly snobbish Cafe at the Hotel Sacher Salzburg used to be called "Österreichischer Hof" ("Austrian Court"), but several years ago the directors found that international guests would be unable to pronounce that and therefore be more likely to end up with competitors. So "Sacher Salzburg" was born, as it happened to be owned by the same people as the famous Hotel Sacher in Vienna. The bonus: you can buy an obscenely overpriced piece of REAL Sacher tart there. Whilst Cafe Niemetz has always benefited from the musicians at the festival hall, the Bazar draws the crowds from the Landestheater Theatre and other stages nearby - actors and guests alike. You will also find journalists and writers, especially in the mornings, before the tourists arrive. Face the statue of Mozart on the Mozart Square whilst having a cup of Kleiner Brauner. Its central location and seating that extends to the outside make the former Cafe Glockenspiel one of the most popular Cafes of Salzburg. And now for something completely different - the Shakespeare at St. Andrä Church on the Mirabellplatz Square is grungy, non-traditional and arty. Good food and changing exhibitions of local, contemporary art make the Shakespeare one of the favourite hangouts among students. More a bistro than a cafe, but yet a good place. So finally…what is a "Verlängerter"? Well, try to find out yourself by going to one of the mentioned coffeehouses. If you like coffee, you won′t be disappointed!